SOUTH CHINA SEA - USS William P. Lawrence (DDG 110) conducted a routine patrol May 2 in international waters during a regularly scheduled 7th Fleet deployment. "This operation was a great way to show our strike group’s ability to disperse forces for different missions and cover a broad area of water in 7th Fleet,” said Cmdr. Walter C. Mainor, commanding officer, William P. Lawrence. U.S. Navy ships conduct routine patrols like this one in the 7th Fleet area of operations throughout the year and average roughly 700 days annually in the South China Sea alone. 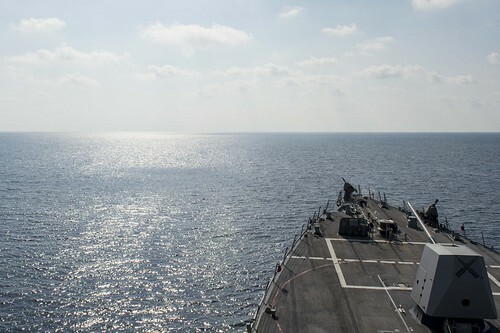 The guided-missile destroyer USS Stockdale (DDG 106) completed a similar patrol, March 5. In recent months, other U.S. Navy ships conducted similar operations including the guided-missile destroyers USS Curtis Wilbur (DDG 54), USS Lassen (DDG 82), USS McCampbell (DDG 85) and USS Preble (DDG 88), the multi-purpose amphibious assault ship USS Essex (LHD 2), the guided missile cruiser USS Chancellorsville (CG 62), the littoral combat ship USS Fort Worth (LCS 3) and the amphibious dock landing ship USS Ashland (LSD 48). William P. Lawrence is currently deployed to 7th Fleet as part of the John C. Stennis Strike Group (JCSSG). The strike group is comprised of USS John C. Stennis (CVN 74) with Carrier Airwing (CVW) 9 and Destroyer Squadron (DESRON) 21 embarked, Arleigh Burke-class guided-missile destroyers USS Chung-Hoon (DDG 93), USS Stockdale (DDG 106), USS William P. Lawrence (DDG 110) and Ticonderoga-class guided-missile cruiser USS Mobile Bay (CG 53).